Om Shree Ganeshaya Namaha! 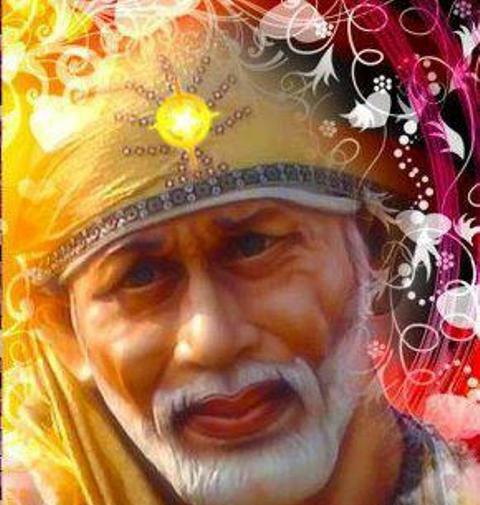 Om Sai Ram ! Om Namah Shivaya! If you sit with a person who is smoking, even without ur knowledge- You will end up inhaling the second hand smoke..In the same way, if you will be in the company of saints who constantly preach about the importance of doing good karma-, automatically even without your knowledge- you will end up doing a lot of positive and humble deeds. Like wise, If you will be in the company of a person who keeps saying bad words and abusing others ,- then obviously whether you like it or not -- u will end up being the same kind of a person sooner or later. But if you constantly listen to Gods name, his praises and his bhajans-even without you being aware of it - the words that will come out of your mouth will be nothing but the nectar of love and bliss. So be in the company of God and even without your knowledge-You will find him seated in your heart - talking to you and finding solutions to your problems and worries.You just need to take one step towards Him and He will take 100 steps towards you.. The episode begins with Mahadev and Parvati taking thier positions on either side of the curtian,Mahadev looks at Parvati but Parvati still hasnt looked at him and has her eyes lowered.All the Rishis along with Mahadev are served.Himavan asks Mahadev to eat well,as till the wedding gets over none of them will be able to consume anything.Mahadev signals the Rishis and he begins to eat along with them...Everyone begins to eat,and soon the Rishis finish thier food but Mahadev is STILL eating.Slowly everyone comes to realize the amount of food Mahadev is consuming and everyone gets worried.Kashyap is worried that Mahadev still hasnt stopped eating,and worried about Himavans reputaion if all the food gets over.Brigu asks Narad muni to do something.Narad looks confused but tries to hint at Mahadev about how much he is eating and asks him how is the food.Mahadev shows him a puri and gleefully continues to eat.Nandi goes and tells Mahadev that Parvati will eat only after he has eaten from the same plate as him.Mahadev still continues to eat and is almost emptying vessels into his plate,and is asking for more.Himavan and Nanima are worried,Jaya and Vijaya inform Parvati that Mahadev has finished almost everything and there is hardly anything left for her,the rest of the Varpaksh or them.Himavan and Nanima say they cannot stop Mahadev from eating-hes thier son in law,they already insulted him they cannot under any circumstances do it again.Nanima send Jaya and Vijaya to check the kitchen.In the Kitchen all the food is over and Himavan is informed of it.Himavan panics and asks the cook to make more food.Nandi asks Parvati to do something or Mahadev will consume all the food in the world.Parvati smiles and says she knows how to make Mahadev stop eating. Parvati goes and stands in front of the curtain and looks straight into Mahadevs eyes. Parvati asks him what kind of Leela of his is this? Mahadev replies-I cant help it im feeling hungry. Parvati says -i know why you are doing this,its beacuse i didnt look at you during the Jaimala isnt it?. Mahadev cutely replies,had you looked at me then i wouldnt have had to do this. Parvati crosses the curtian and comes near Mahadev.Parvati sits down and looks straight in his eyes,Mahadev looks back and smiles..She lovingly scolds him-you are dressed like a human you are acting like one too? ?.Mahadev smiles,Parvati feeds him a morsel from her hands ..Mahadev lovingly eats it.Everyone is looking at thier cute little scene smilingly,not to forget moony eyed.Parvati feeds Mahadev another two morsels when Mahadev says enough-im not hungry any more,the three morsels you fed me have fulfilled my hunger.Parvati gives him a new Name-Leeladhar.Mahadev tells Nandi to put his plate on Parvatis side so that she can eat too.Mahadev sees everyone looking at them and innocently asks why are they looking so tensed?. Parvati crosses sides and goes back to the Vadhus side.Himavan says all the food is finished they will have to wait for sometime food needs to be cooked again.Parvati smilingly asks him-didnt he understand her Bholenaths leela?-he only ate the three morsels SHE fed Him,the rest of the food will still be there.Himavan looks confused.Back in the kitchen all the vessesls are full,Nandi smiles and says he forgot Parvati is Annapurna-with her being there how could have the food gotten over?. Jaya and Vijaya are walking with Parvati down the hall when a daasi informs her of someone wanting to meet her.Parvati leaves to meet him. Its the old Shilpakar who thinks that Parvati wouldnt want to meet him,hides his gift and is about to leave when she arrives.Parvati kindly asks him-he wanted to meet her,why is he leaving without meeting her at all?-isnt he going to give her blessings?.He tells her you are a Princess,i am a small shilpkar why would you want to meet me?.Parvati smiles and tells him,had it not been for his son she in her past life as Sati would have never gotten to know of her true purpose in life. *Flashbacks of Sati with the Shilpkars son are shown,where she is given the Shivling by him*.He bore so much due to what he did for her*a flashback shown again of him telling Sati of them being banished,he standing up for Sati and not blaming her*.Parvati says she is grateful for whatever he did for her,and respects him with all her heart.The Shilpkar gets emotional and gives Parvati her gift-a Shivling. Parvati accepts the Shivling smilingly*Flashbacks of Sati accepting the Shivling are shown*,and promises the Shipkar this gift is most precisous to her and she will cherish it forever. Nandi,Jaya,Vijaya are unable to find Mahadev.Jaya and Vijaya go to inform Ranima,while Nandi is worried where Mahadev went leaving Parvati at this hour. “Thats funny!” a voice interrupts. ” Its funny to know there is someone who is not even alive , is talking about giving their lives! !” Indra mocks. “They need your kindness not your indifference” a wise Nandi says. 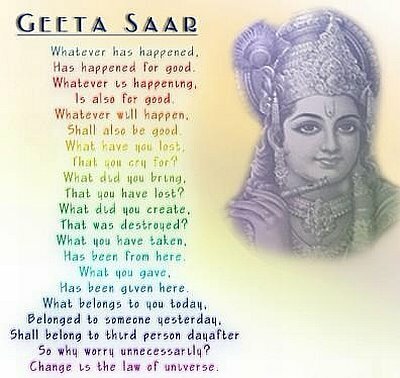 ” Remember Devraj we complete each other --- how the beauty and ugliness are complimentary likewise you too are non -existent without us!” one of the Pryats utter and all of the prytas n gana laugh at this. “It seems as if staying with Mahadev you all have mastered philosophy ” counters Agnidev and he challenges if they can do what they say. Himvan requests them to the hall in order to attend n enjoy the scholarly meeting (Shastrath) and find the answers to their questions and that they are being expected by many wise and enlightened ones. Prytas and ganas never hear to something called a scholar meet.. yet they decided to go. One of the scholars addressing the rest, utters his gratefulness towards Himvan as it was he who is responsible for the growth n enrichment of wisdom in the kingdom. On the other hand the pryats n ganas are clueless about this Greek language which is been spoken by all at the hall. Where the prytas are guessing the answer..Devraj Indr says that its damn simple! “In my view that thing has to be Kaam – Pleasure!” says an arrogant Indr. “That’s fine Indrdev, but there is only one desire that is esteemed ” says the scholar. The ganas are glad to know the answer. “That desire is to integrate oneself into the divine! You all are the devas, free from the cycle of birth and death, you have to be wiser than us; you couldn’t even answer a simple question! ” replies the Scholar. The devas ponder hard on this, but no one answers. “That is ‘Atma[soul]’ , there is no end for an Atma ” the scholar himself answers. This showcase of knowledge goes on for a while …where ganas are guessing what might be the answer and Mahadev endure this show- off! “You dont need me for that, for your next question my Gan and Pryats are enough! ” replies Shiva. Parvati has some leisure when Menavati comes to her. Menavati says that she is very happy today, every ritual is taking place very well and that’s because of Mahadev’ grace. To see her daughter as a bride she feels liberated. Menavati feels proud of her daughter’s resourcefulness and capability; she feels that her purpose is served as a mother seeing her. “Parvati, you have stopped me from doing a grave mistake of not accepting Trikaldarshi – Mahadev as my SIL . Will you be able to forgive me for this?” Says an emotional mother. Menavati starts her self loathing session saying that she was so adamant about Shiva n her daughter’s relationship. 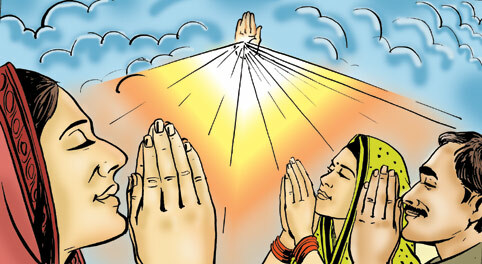 “Its not needed mother, Mahadev is all knowing – beyond word and language . If the apology is asked with true heart, he would forgive you.” says the daughter. Menavati hugs her daughter saying that her little Parvati has become so wise. The scholar warns the gans n prytas that the question is gonna be complex and difficult… which did worry the prytas. “Listen carefully – How many sparrows are their in Himvan’s kingdom? ” questions the Scholar. The pryats giving it a guess says “19,000.” and other gans go by that estimation. “Undoubtedly, they must have gone to the neighboring states to meet their dear one’s ” laughs the Prayats. “What if the number is more than that guessed?” Agnidev asks. “Then probably the others have come down here to meet their dear one’s” Pryta replies. The prayts have fun and Himvan is kinda amused..where the scholars and devas are pissed off. The scholar gestures by lifting up his hands and waves it at the end shows his index finger- as one. Nandi retors saying what kind of question does that make.? Siva asks Nandi to answer the question – what ever comes to his mind. Nandi answers by showing two of his fingers (Index and middle)hinting the answer is 2 . Then the scholar shows three by his finger..Nandi replies a 5 showing all his open hand. The scholar is shocked to see Nandi answer the question rightly. And Nandi does something like an angry bull posture . “Do you accept your defeat pandit” Shiva replies. All the ganas and pryats have a big laugh! Where the scholars feel insulted. “Tells us Mister, now is your doubt cleared? Now accept your defeat” asks Shiva . Shiva asks if that was the case, then why did he seem so worried! A scholar reasons with Shiva that no such knowledge exists in this world, Ved teaches- prayers to the God, (vrath) fasting , tap(penance), gyan (knowledge) and work (Kriya); then how can be the Nirgun (arbitrary- formless) thing be true? “Very soon, I will combine the knowledge within all the veda’s and make upanishads . I’ll make all these puranas, vedas etc understandable to the humans.” announces Mahadev. Himvan gets up and informs Mahadev that the knowledge given by him will be made public and is grateful to him. Himvan announces that a pooja is to be done to Mahadev in his form as a groom. Vijaya n Jaya inform Nandi that Mahadev is not in his room. Nandi is worried as to where Mahadev has gone leaving his Mata Parvati alone in the mandap. God is the Embodiment of Love. The noble teachers and kings who were born with the spark of divine power have made efforts to protect righteousness and spread the feeling of oneness among the humans. When need arises, God incarnates on the earth in the human form. 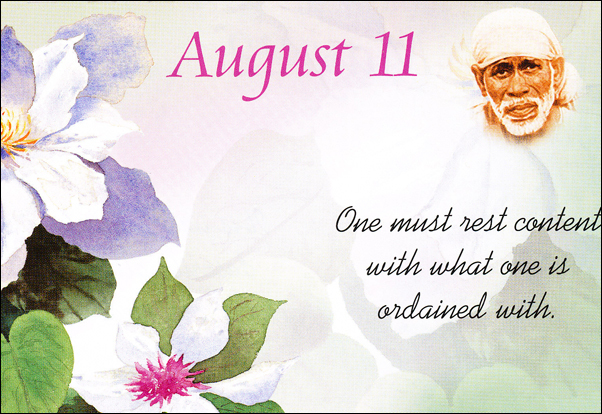 One such divine incarnation is Shirdi Sai, who can break all shackles and liberate His devotees. 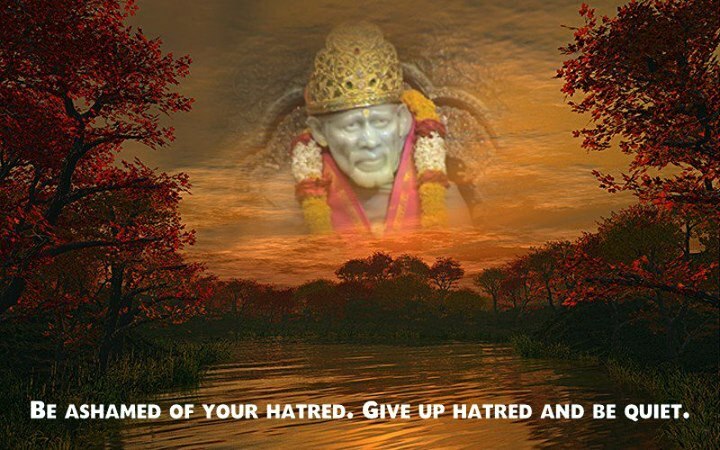 Baba used to teach that not only we must love our fellow-beings but also all living beings. He always addressed people very affectionately as 'brother', 'mother' and 'sister'. Baba would say that if one is unable to give charity, he should say it politely. Thus, Baba would bind the hearts of devotees with His philosophy of love to see that people are bound by friendship and mutual kinship. 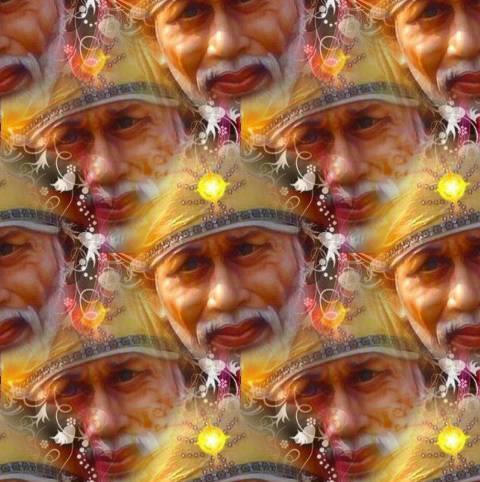 Baba gets wild if any one interferes when a devotee was serving Him. They used to gather all the offerings of devotees and used to dine with Baba with great relish. While offering food to all His children, He used to share His nectarine love. 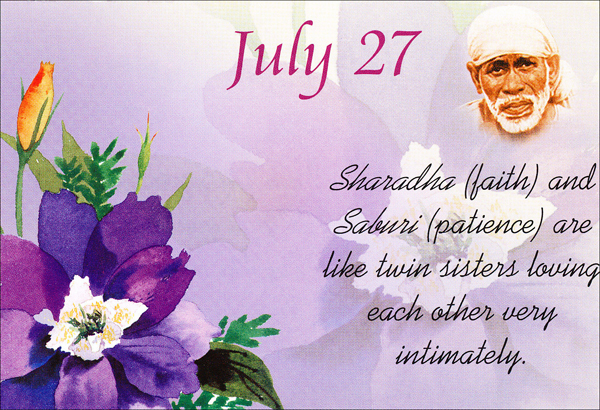 Those who adore Baba as their Mentor and God would live as one family in love and joy. 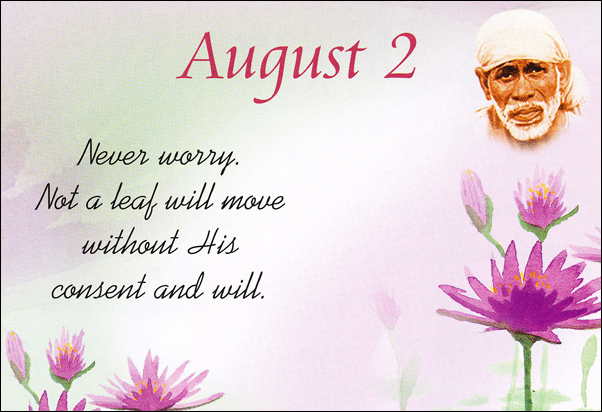 Not only then, but even now the hearts that are filled with devotion for Baba are overflowing with love. The consciousness of Baba will fill the hearts and all those who have faith in Baba will get redoubled love and happiness from Him as His gift.